One of the top three New Year's resolutions of 2017 is to make better financial decisions. We get it; new year, clean slate, fresh start. If you're raising kids, this might even be resolution number one. A report from the U.S. Department of Agriculture estimates that it will cost roughly $233,610 to raise a child born in 2015. Clearly, being a parent doesn't come cheap. 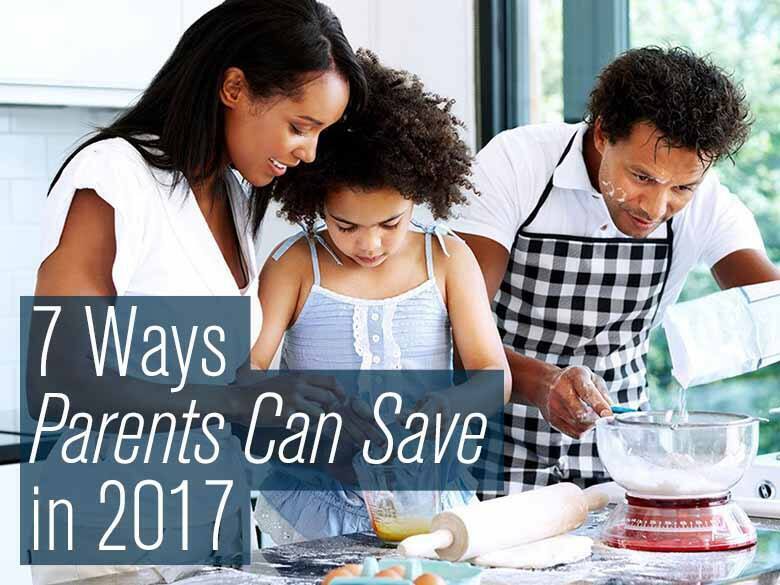 To make things a little easier though, we rounded up seven tried-and-true ways families can stretch their dollars in 2017. Diapers are one of the biggest budget-busters for parents of babies and toddlers. Prices vary across stores and brands, and our research shows that the average parent will spend anywhere from $490 to $950 on diapers during the first year. But, we've found that you'll almost always snag the biggest savings if you opt for a diaper subscription. Amazon Family is a biggie, doling out 20% off all diaper subscriptions for Prime members, plus free shipping. Target is another winner; signup for a diaper subscription and you'll get 5% off along with free shipping. You can reduce your cost by another 5% by using your REDcard. Target also runs frequent promos for free gift cards when you buy a certain quantity of diapers, saving you money on your future diaper purchases. This is such a great way to save. We used to go to an adult hair salon for our girls' haircuts, which would cost us $50 before tip. We now opt for our local Aveda student salon, which costs us $24. Yes, these are students who are still learning the craft, but it's pretty hard to botch a kids' trim and blow-out. I've also gotten my own haircuts at a Paul Mitchell student salon and never had any complaints. According to the experts at Allure, most people need a haircut every six to eight weeks or so, which translates to anywhere from six to nine haircuts per year. Being a family of four, let's say we each get seven $50 haircuts a year. That works out to $1400 per year. At our student salon, that number drops to just $672. This has been a huge money-saver in our house. Instead of winging it at the grocery store, plan ahead and map out your meals for the coming week. You'll be less likely to hit up a drive-thru, and you won't end up letting food go to waste as frequently. When you factor kids into the mix, this is something that adds up really fast. Begin by doing a quick inventory of what you already have, then incorporate these ingredients into your plan so you have fewer ingredients to buy. If you really want to save big, check out the circular ad for your local grocery store beforehand, and plan your meals around any good deals. You can also save both time and money if you incorporate bulk cooking into your plan. For example, whipping up fresh muffins out of overripe bananas costs pretty much nothing and makes breakfast on school mornings a whole lot easier. Also, plan to make extra-large portions for dinner, then opt for leftovers the following day. If you and the kids get home late from soccer practice or band rehearsal, it seriously takes the headache out of the dinnertime routine. One final tip: always opt for fresh fruits and vegetables when you're shopping. While it's really tempting to just throw pre-cut fruits and vegetables into the kid's lunch boxes, try and keep the urge in check as there's a huge price jump here. For instance, my local supermarket (Publix) is currently selling 2.5 pounds of cut pineapple for $12. Meanwhile, a whole pineapple is just $2.99. It's pretty much the same deal across all fruits and veggies. This one takes the cake. How much do you routinely spend on babysitters? When my husband and I went to a wedding last year, we spent close to $100 on childcare for the night. We've definitely wised up since then. These days, we're all about the babysitting swap. Let me explain. My brother and his wife live a mile away and have two kids. About twice a month, I take their kids for a sleepover so they can go out on a date night. Then they return the favor on two other nights. Sure, our house is a little hectic when we have all four kids, but it's so worth it. Our children have an absolute blast and so do the parents — without having to pay a dime for a babysitter. Try setting this up with a close friend or family member. When it comes to buying kids' stuff, I'm all about deals. To start, take advantage of loyalty programs if you do most of your shopping at just a couple of places. We do this at Children's Place and Old Navy for clothes, and Famous Footwear for shoes. Frequent coupons and reward points can definitely add up to big savings when you're shopping for the whole family. Another hack is to time your purchases to reap the biggest savings. For example, our experts say that the five weeks leading up to Aug. 30 is the best time to stock up on school supplies, while May is the optimal time to buy sneakers; January is a great month to replenish the family's winter wardrobe. Finally, if you're expecting, don't underestimate the power of the baby registry. Amazon Family and Target both dole out a 15% registry completion discount; Babies "R" Us gives 10% off. You can also expect a free goodie basket just for signing up. After recently upgrading my kids to a bunk bed, I was left with two toddler beds and a pair of mattresses on my hands. I put them on Craigslist and quickly got $200 for everything, which basically paid for the new bunk bed. There are tons of parents out there who love to shop second-hand for kids' stuff. (Trust me, I'm one of them.) Over the years, I've sold everything from strollers to nursing pillows to breast pumps on Craigslist. And if Craigslist makes you skittish, a yard sale can be equally effective. Similarly, don't rule out kid-centered consignment shops. The key is to wait until you have a lot of stuff to sell so that you can really cash in at these shops. If you don't have any stores like this in your area, you can also donate the items to charity, then put the receipt toward your annual tax deductions. Childcare during the summer and winter school breaks are a huge expense. The most popular local camps in my area charge more than $1,000 total for full-time care during the summer break. Luckily, there are a few ways to save here. If you can swing part-time enrollment with your work schedule, that will significantly cut the cost. If you need full-time care though, consider teaming up with friends who have kids and sharing the cost of a care provider rather than spending big bucks on an individual babysitter. Don't forget about the trusty YMCA either, which typically offers specialized camp programs, such as cooking camp or dance camp. Your local library, little league or other sports teams might offer similar programs. They're only a few hours a day, so the price is usually reasonable. If you work from home, you can also go with a "mother's helper." You stay home and work while you pay a neighbor or family friend to come over and play with the kiddos (think a pre-teen kid you trust). It's less expensive than hiring a babysitter, and if they need anything, you're home. Have your own savings hack up your sleeve? Share in the comments below!